Slightly surreal promotion in places but well worth supporting. Donate here. This inspiring video shows how powerful music can be in helping people with dementia to retain their sense of person and to communicate. A remarkable approach to dementia in Holland. Providing familiar, safe environments for people with dementia makes them feel at home, reducing stress and confusion, as well as stimulating memories from their past. Music cannot heal people with dementia but this short inspiring video shows yet again how it can help people with dementia to enjoy life more. In reality I have a lot of news to blog about today, but can’t get my head around how to write it up. 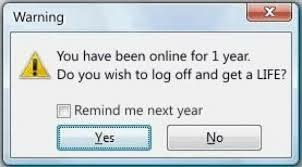 Then as it is Tuesday, I was looking for something for my Tuesday humour theme, this popped up, so for today, as I have been online for more than a year, I am off to get a life!